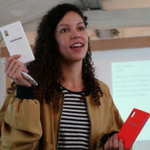 Lina is the Campaign & Events Manager of Fairphone. She is passionate about tech, innovation and startup projects. And she combines this passion with her pragmatic approach, project management-rooted approach to communications & marketing, PR & events, and customer satisfaction. Lina managed Barcelona’s startup and tech events Fest Up and Next Bank BCN in 2015, was the Global Event Organiser of the 2016 Global Bubble Parade in 70+ cities worldwide, and took Fairphone all around Europe in 2017 for MWC17, TNW Conference, and Heldenmarkt to showcase how the electronic industry can have a positive impact.